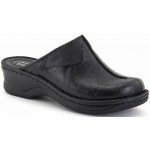 Josef Seibel Catalonia 56512 women's leather mule. It's soft leather uppers, lining and footbed provide cushioned comfort and allow feet to breathe. These slip on mules are finished with stitched detailing and foldover collars for everyday wear and have a 4.5cm wedge heel. A classic clog style, Josef Seibel Catalonia is available in two colours, black and brown from a size 36-41 (3-8).